A 5.1 mile round-trip hike leads you over creek crossings and rock outcrops and past miniature waterfalls to the 400-foot Raven Cliff Falls. The hike follows along a deep creek bed, Dodd Creek, taking you from east to west over moderate elevation gain of 300 feet. Just after 0.25 miles, you’ll come across a swimming hole that is the perfect spot to take a dip, although better to enjoy on your return trip. A wooded bridge crosses Dodd Creek, and although the mechanics don’t look stable, the bridge proves to be sturdy enough to hold weight. It’s not until the final ascent that your elevation will spike significantly from just above 2,500 feet to 2,600 feet, as you scramble over rock outcrops and jagged stones. You’ll round out the 2.5 mile hike at Raven Cliff Falls, a granite, white-washed set of cliffs that provides an angular contrast to the surrounding woods. 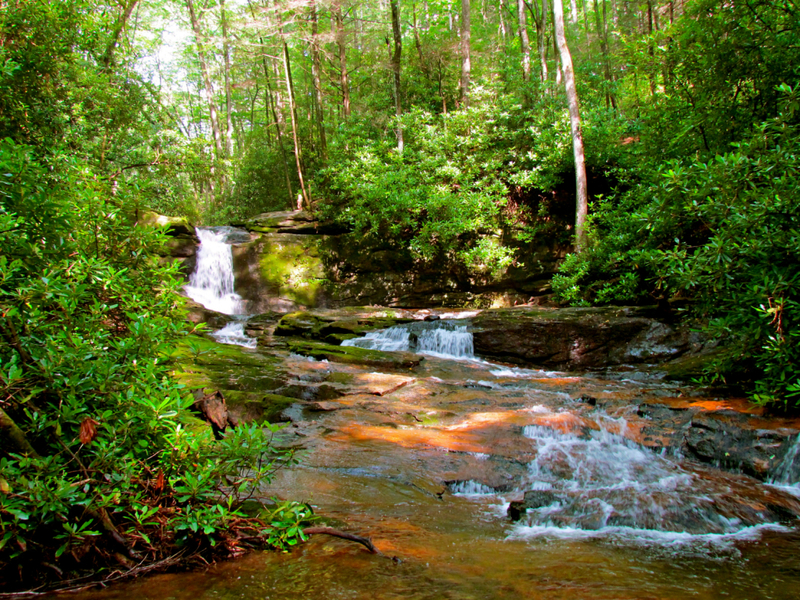 The hike is speckled with creek crossings and steep drops where smaller waterfalls spill through the forest canopy. The Lower Raven Cliff Falls is just as beautiful, as the water spills over moss-covered boulders into a shallow pool. This proves to be another worthy swimming hole in summer. 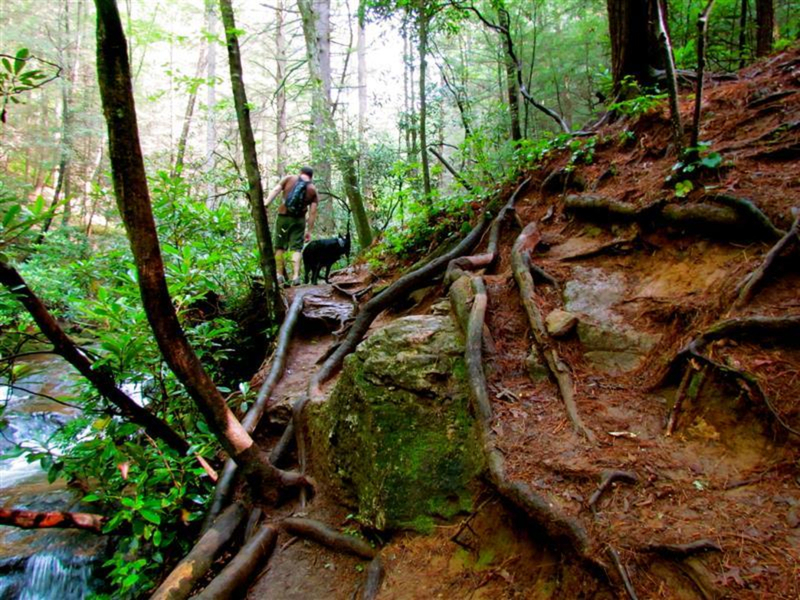 The short, steep climb to Raven Cliff Falls is worth the added effort. The water cascades between two 400-foot granite cliffs. This unique waterfall is the namesake of the hike, as it seems like the water has split the two cliffs in half. This is a worthy photo op, so spend time to set your camera on a tripod and shoot on low shutter speed for a photo that makes water appears to look like silk. Families will enjoy the easily navigable terrain and the picturesque waterfalls. Along the hike, children will love splashing in the shallow pools, which offer a welcome reprieve in the heat of summer. Since the hike follows a deep creek bed, the southern ridge of the mountain shades the trail, making it a cool summer hike. For backpackers, several primitive sites offer creekside camping. There are three campsites that are a short distance from the parking lot, or three primitive campgrounds along the hike. The trailhead is located by Duke's Creek, off GA-348 north. A small paved road, marked the Chattahoochee National Forest sign, leads you to the parking lot and trailhead. There is no fee for parking. During the height of fall leaf-changing season, this trail gets heavy use. Primitive campsites are situated along the trail, just beside the creek. The sites are first-come, first serve. Be sure to use a bear canister, as black bears are known to frequent these woods. The ambient bubbling of the creek is a natural sound machine that will lull you to sleep.